Judy was raised in Western Pennsylvania where her creative spirit was inspired by the landscapes and history of her home town. Although she enjoyed painting and drawing throughout her childhood, she chose Medical Technology as a profession and received a B.S from St. Francis College, Loretto, Pa. in 1979. The artist worked as a research scientist until the birth of her first child in 1988. For 20 years, Newtown, Bucks County Pa. was her home. The paintings she created during that time reflect her emotional ties to the community. Throughout those years she contributed to the preservation of the historic landmarks in Bucks County. From 2005 to2010 Judy donated a painting to the annual Pearl S. Buck Foundation’s “Tastes of the World “event and auction. She was given the rare privilege to photograph the interior rooms of the estate. 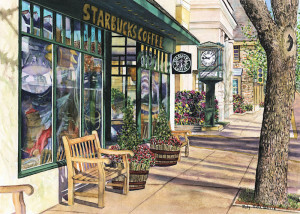 In addition, her work is displayed in public and private collections throughout Bucks County and Philadelphia including the Tyler Estate on the Campus of Bucks County Community College. Juried exhibits included Phillips Mill, The Philadelphia Sketch Club and “Ellarsie” Open at the Trenton Museum. LaTorre has had many solo and group exhibitions throughout The Delaware Valley. She was commissioned by Stuckert and Yates Attorneys in Newtown in 2003 to create “Marshall Law,” one of the Miles of Mules’ sculptures .She is featured in a book commemorating the event. The artist relocated to the Pittsburgh area in 2010, but returned home to Newtown in March 2014. “Marshall Law” – Sponsor Stuckert and Yates Attorneys, Newtown Pa.